I, Hold a service with prayer to bring Israel together and away from engaging in evil Racial Tension with each other as much as possible. In the Future, in cities like "New Birmingham" there will be walls. As in new age Racial Segregation walls partitioning different neighborhoods from each other to quell Racial Tension. This will be mainly between the Americans (which were dominated by the Blacks- Southern Tribes) and the Non-Americans (which were dominated by the Latinos- Northern Tribes). 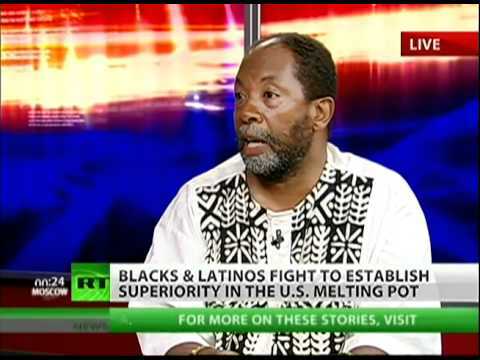 Below is why there are tensions between Blacks, Natives, and Latinos. 19 So Israel rebelled against the house of David unto this day. Members of a Latino street gang have admitted to carrying out a racially motivated firebombing attack on black families in a Los Angeles housing project, prosecutors announced Thursday. Three men belonging to the Big Hazard gang will plead guilty to federal hate crimes stemming from the 2014 attack, according to written plea agreements. In exchange for the confessions, prosecutors for U.S. Atty. Nicola T. Hanna agreed to seek some leniency for the men when they are sentenced. Each faces more than 30 years in federal prison. The nighttime attack on Mother's Day four years ago laid bare long-standing racial animosity Latino gangs have stoked in the Ramona Gardens Housing Development and elsewhere. The Big Hazard gang claimed the Boyle Heights housing project as its territory and the men set out to terrorize black families into fleeing their apartments, according to a statement released by Hanna. Jose Saucedo, 24, Edwin Felix, 26, and Jonathan Portillo, 23, were part of a group of eight gang members who carried out the well-planned attack. Three other members of the gang previously pleaded guilty to participating in the bombing. As part of the plea deals announced this week, prosecutors will not require the three men to testify against the alleged ringleader of the group and an eighth man, who have maintained their innocence and face a trial this summer. Details of the earlier guilty pleas have been kept under seal. The attack was discussed at a gang meeting in early May 2014, prosecutors alleged, where the purported ringleader, Carlos Hernandez, 31, told gang members that they would use Molotov cocktails to firebomb apartments of some of the 23 black families living in Ramona Gardens at the time. Hernandez said the order for the attack had come from figures in the Mexican Mafia, a prison gang that controls many Hispanic gangs in Southern California, according to court filings. On May 11 — Mother's Day — the group met again to prepare for the attack, the indictment said. At that second meeting, Hernandez assigned each gang member a specific job: breaking apartment windows, lighting the devices, throwing them inside. He also handed out disguises and gloves, according to the indictment. Prosecutors allege the men didn't carry cellphones to prevent police from tracking their movements and purposefully avoided security cameras as they sneaked up on their targets. After midnight, the men smashed windows of four apartments they had scouted out and threw in the lit explosives, according to the plea agreements. Black families, including women and children who were sleeping during the attack, lived in three of the apartments, prosecutors said. A mother who was asleep on a couch with her infant in her arms narrowly missed being struck by one of the firebombs, the statement said. "It was a miracle that no one was injured in these racially motivated attacks," Hanna said. "These defendants have admitted their goal was to drive African Americans out of this housing facility. This simply will not be tolerated, and we will take any and all steps necessary to protect the civil rights of every person who lives in the United States." The racial friction persisted after the attack, according to the indictment. Months later, prosecutors allege, a gang member confronted a black family and "warned that they should leave Ramona Gardens or that they too would get firebombed." The case is the latest of several over the last two decades against Latino street gangs accused of using violence to push rival black gangs out of certain neighborhoods. A few years ago, federal prosecutors charged members of a Latino gang with a campaign to push blacks out of the unincorporated Florence-Firestone neighborhood that allegedly resulted in 20 homicides over three years. In the Harbor Gateway district of L.A., a Latino gang was accused of targeting African Americans, including 14-year-old Cheryl Green, whose 2006 death became a rallying point against such attacks. And members of a Latino gang in Highland Park were convicted of a series of assaults and killings in the early 1990s. In Ramona Gardens, the Big Hazard gang tried to keep blacks out for more than a generation. On Aug. 30, 1992, an explosion ripped through the pantry of a Ramona Gardens apartment where a black couple and their seven children lived. Another black family across the street had been attacked minutes earlier. At the time, seven black families lived in the project. After the attack, they left. For the next two decades virtually no blacks lived at Ramona Gardens. Big Hazard had deep connections to the Mexican Mafia, which directed attacks on blacks, authorities allege. Eventually, black familiesstarted moving back to Ramona Gardens, a sign of progress in a community and a city that was working hard to put the violence of the 1990s behind it. Then came the 2014 attack. At least one resident said at the time that she would ask for an emergency transfer out of the complex. Others insisted they would stay. In late 2016, about 4% of the nearly 1,800 people living at Ramona Gardens were black, according to most. This is why they can use our weaknesses such as poverty and competition for resources to create differences between us. Then these differences are used against us to divide us then conquer us. 11 And the Lord shall bring upon them divisions one against another. 12 And there shall be continual wars in Israel; and among men of another race shall my kingdom be brought to an end, until the salvation of Israel shall come. 13 Until the appearing of the God of righteousness, that Jacob, and all the Gentiles may rest in peace. 14 And He shall guard the might of my kingdom for ever; for the Lord aware to me with an oath that He would not destroy the kingdom from my seed for ever. 32:00 REVERSE SPEECH EXPERTS PLAY OJ BACKWARDS. IN THE SCIENCE OF REVERSE SPEECH- THE IDEA IS THAT WHEN YOUR WORDS ARE PLAYED IN REVERSE IT SHOW THE TRUE INTENTIONS BEHIND WHAT YOU SPEAK. THIS IS HOW 1 INTERPRETED WHAT OJ SAID= OJ BOOK DEAL FOR THE BIGGEST PAYOUT IS A RACE WAR OVER MONEY!! 12 Therefore, thou son of man, say unto the children of thy people, The righteousness of the righteous shall not deliver him in the day of his transgression: as for the wickedness of the wicked, he shall not fall thereby in the day that he turneth from his wickedness; neither shall the righteous be able to live for his righteousness in the day that he sinneth. 13 When I shall say to the righteous, that he shall surely live; if he trust to his own righteousness, and commit iniquity, all his righteousnesses shall not be remembered; but for his iniquity that he hath committed, he shall die for it. 15 If the wicked restore the pledge, give again that he had robbed, walk in the statutes of life, without committing iniquity; he shall surely live, he shall not die. 16 None of his sins that he hath committed shall be mentioned unto him: he hath done that which is lawful and right; he shall surely live. 17 Yet the children of thy people say, The way of the Lord is not equal: but as for them, their way is not equal. 18 When the righteous turneth from his righteousness, and committeth iniquity, he shall even die thereby. 19 But if the wicked turn from his wickedness, and do that which is lawful and right, he shall live thereby. 20 Yet ye say, The way of the Lord is not equal. O ye house of Israel, I will judge you every one after his ways. Let's to go First Epistle of Clement to the Corinthians and enjoy this prayer to return to the ways of God. to whom God has given his grace. fied by our actions, not our words. days: use not therefore much speech. ways by which we may attain unto it. sider all the parts of it. Christ, according to the flesh. princes, and rulers in Judah. wrought, but through his will. the holiness of our hearts. Psalm of Solomon 17 + Hosea 1: A Prayer for deliverance and reconciliation. 17:1 Lord, you yourself are our king forever hereafter, for in you, o God, does our soul boast. 17:2 How long is the time of a human life on the earth? As is his time, so also is his hope in him. 17:3 But we hope in God our savior, for the strength of our God is forever with mercy, and the kingdom of our God is forever over the nations in judgment. 17:4 Lord, you chose David as the king over Israel, and you swore to him regarding his descendants forever so that his kingdom would not fail before you. 17:5 But because of our sins, sinners rose up against us, they attacked us and expelled us. Those to whom you did not promise robbed [us] by force and did not glorify your glorious name. 17:6 With glory they set up a monarchy for the sake of their haughtiness; they stripped bare the throne of David as a price of arrogance. 17:7 But you, o God, threw them down and eradicated their seed from the earth when a man alien to our race rose up against them. 17:8 You rewarded them, o God, according to their sins; it happened to them according to their works. 17:9 God showed no mercy to them; he searched out their descendants and did not release any one of them. 17:10 The Lord is faithful in all his judgments which he makes on the earth. 17:11 The lawless one deprived our land of inhabitants; they did away with young and old and children at the same time. 17:12 In his beautiful wrath he sent them as far as to the west and [made them] the laughing stock of the officials of the country without mercy. 17:13 The enemy acted arrogantly in [his] estrangement and his heart [was] alien to our God. 17:14 So he did in Jerusalem all the things that gentiles do in the cities of their strength. 17:15 And the children of the covenant among the promiscuous gentile became masters of them. There was no one among them who would act in Jerusalem [with] mercy and truth. 17:16 Those who loved the assemblies of the saints run away from them as sparrows fled out from their nest. 17:17 They wandered in the wilderness to save their souls from evil. The saved soul of anyone from them was precious in the eyes of the exiles. 17:18 They were scattered over the whole earth by the lawless ones because the heavens withheld rain from falling on the earth. 17:19 Springs were stopped, from those perennial in the abysses to those in the high mountains for there was no one among them who practiced righteousness or justice. 17:20 From their ruler to the smallest of the people they [were] in every kind of sin: the king in the transgression of the law, and the judge in disobedience, and the people in sin. 17:26 And he will bring together a holy people whom he will lead in righteousness. And he will judge the tribes of the people that have been made holy by the Lord their God. 17:27 He will not permit unrighteousness to pause among them any longer, and any man who knows wickedness will not live with them. For he will know them that they are all children of their God. 17:28 He will distribute them in their tribes upon the land; the sojourner and the foreigner will no longer dwell beside them. 17:29 He will judge peoples and nations in the wisdom of his righteousness. Pause. 17:31 so that nations will come from the ends of the earth to see his glory, bringing as gifts her children who had become quite weak, and to see the glory of the Lord with which God has glorified her. 17:32 And he will be a righteous king over them, taught by God. There will be no unrighteousness among them in his days, for all [will be] holy, and their king [will be] the Lord Messiah. 17:33 For he will not trust in horse and rider and bow, nor will he multiply his gold and silver for war. Nor will he narrow for many nations the hopes to a day of war. 17:34 The Lord himself is his king, the hope of the strong. [Through] the hope in God he will even show mercy to all the nations [who stand] before him in fear. 17:35 For he will smite the earth with the word of his mouth forever; he will bless the Lord's people with wisdom and joy. 17:36 And he himself [will be] free from sin, in order to rule a great people, to put to shame officials and to win sinners by the strength of the word. 17:37 And he will not weaken in his days, thanks to his God, for God made him powerful in the holy spirit and wise in the counsel of understanding, with strength and righteousness. 17:39 His hope [is] in the Lord, who, then, is strong enough against him? 17:40 Mighty in his actions and strong in the fear of God, shepherding the Lord's flock faithfully and in righteousness, he will not let any of them fall sick in their pasture. 17:41 He will lead them all in equality and there will be no arrogance among them that [anyone] among them could be enslaved. 17:42 This is the beauty of the king of Israel which God knew, to raise him over the house of Israel to discipline it. 17:43 His words will be tested by fire more than the finest gold, the best. He will judge in the synagogues the tribes of the sanctified people. His words will be as the words of the holy ones, in the midst of sanctified peoples. 17:44 Blessed are those born in those days to see the good things for Israel which God will cause to happen in the assembly of the tribes. 17:45 May God hurry up his mercy over Israel; may he deliver us from the impurity of unhallowed enemies. 17:46 The Lord Himself is our king forever hereafter.